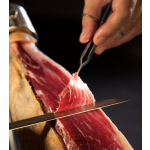 Picking up and arranging wafer-thin carved slices of jamón ibérico ham can be a tricky thing - but not if you're well prepared! Cinco Jotas professional ham tongs can save your day. 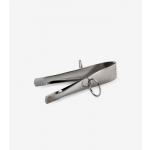 With a sturdy hinge mechanism and curved, flat tips, these tongs will help you handle your freshly-carved ham with ease. They are sufficiently flexible and resistant for maximum precision and feature two soldered rings for fingers to allow a secure and comfortable grip. Made of stainless steel, these useful tools are not only durable but they are easily cleaned, allowing you to focus on your carving skills and enjoying some culinary delights with your guests! 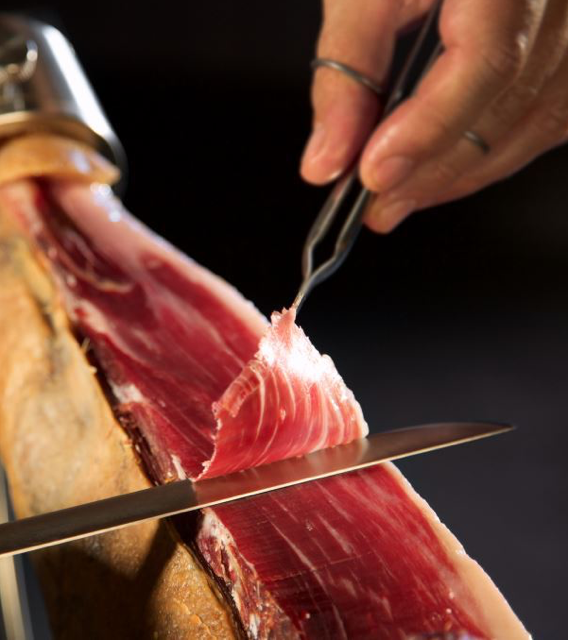 What a healthy pleasure is is indeed to enjoy authentic acorn-fed 100% jamón ibérico. Iberian ham de bellota is filled with nutrients and vitamins not easily found in other foods and it's filled with strong antioxidants and high in vitamin E too. Why not combine your delicious jamón with slices of tomato to double these nutritious benefits, while at the same time doubling your culinary pleasure!